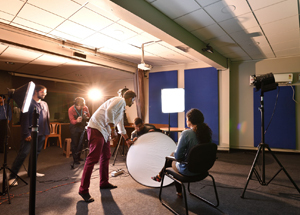 The program of School of Science Studies and Animation of CMR University gives students the experience of being in the full animation and VFX production pipeline. If you are an aspiring visual effects artist, 2D or 3D animator, or storyboard artist, you will learn from industry professionals in the heart of the animation industry. Gain the skills you need for a exciting career in this vibrant and growing industry from our School of Animation & Visual Effects (VFX) . Candidates who have passed in 10+2 / PUC or equivalent are eligible for admission to the programme. The Chroma studio is fully integrated mini studio with Chroma floor. 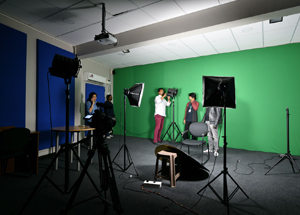 The studio is equipped with high end video cameras, soft boxes with both warm and cool lights, Chroma key arrangement, huge black background option or green views fully balanced with indoor light are some of the visual treats that this studio can provide. Dedicated music production lab with iMac systems with MIDI Keyboards and Focus Rite Interface. The lab also has various Photo editing and manipulation platforms along with high end video post processing softwares.